Oregon State Quarters are the 33rd variety in a series of fifty design changes over a ten year period from 1999 to 2008. This Quarter was released into circulation on June 6, 2005. 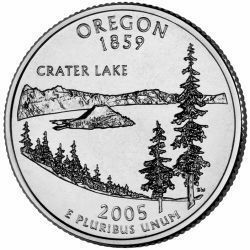 The reverse of the Oregon quarter shows a panoramic view of Crater Lake shown from the southern rim. Crater Lake is the deepest lake in the United States at 1,949 feet. The coin also shows Wizard Island rising up in the center of the lake with pine trees on the shore. The reverse of the coin bears the inscriptions "OREGON 1859”, "CRATER LAKE" and "E PLURIBUS UNUM" along with the date of 2005.